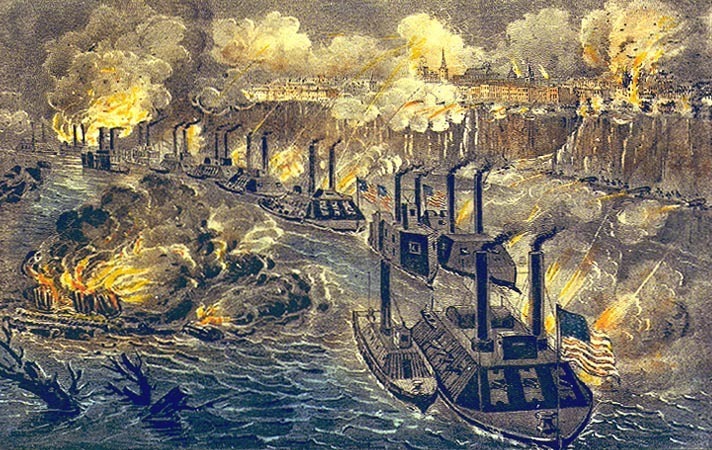 "Admiral Porter's Fleet Running the Rebel Blockade of the Mississippi at Vicksburg," Currier & Ives, 1863, courtesy of the Beverley R. Robinson Collection, U.S. Naval Academy Museum. Blockade-runners for the Confederacy also played a significant role in Liverpool's maritime activity during the Civil War. Ships involved in this enterprise attempted to evade the northern blockade of southern ports to bring munitions to the Confederacy and cotton back to Britain. The supplies provided by blockade-runners were vital to the Confederate war effort. The return voyages did little for Britain’s overall supply of cotton, but they were often hugely profitable for the merchants involved. One single return trip could pay for the cost of building and equipping each ship. British ships attempted to run the blockade roughly 1,300 times, and more than a thousand of these attempts were successful. Almost all of these runs began in Liverpool, and the successful ones also ended there. Sons of a shipbroker and the grandsons of a cotton broker, brothers Arthur and William Forwood were among Liverpool’s most successful blockade-runners. While there was nothing illegal about the activity for British nationals, popular opinion of the business was negative because it undeniably helped to sustain the Confederacy’s slave economy. Nevertheless, the Forwood brothers made fortunes and became influential political leaders in Liverpool. Arthur became Mayor of Liverpool in 1878-79, and a government minister in 1886. William became Mayor in 1880-81, and was president of the Liverpool Chamber of Commerce in 1871, and from 1878 to 1881. He was also a city councilor for forty years. Arthur and William were even knighted in 1895 and 1883, respectively. Behind every one of these clandestine transactions for both arms supplies and blockade running, military or commercial—stood Fraser, Trenholm, & Co. and its managing director and Abercromby Square resident, Charles Prioleau. The company was the financier and procurer of everything Bulloch and the Confederacy wanted to source in Liverpool and throughout Great Britain. Their activities were conducted in secret, so the Union set up a spy network in Liverpool to observe pro-southern activities. Through intelligence from this network, Charles Adams, the American Minister in London, pressured the British Government to intervene and stop the building of Confederate warships. With some delays, and particularly in response to the CSS Alabama controversy, Adams eventually achieved his goal.